Health experts have warned against overeating during the holy month of Ramazan as this can cause several stomach related diseases. Every year during Ramazan, emergency rooms at hospitals across the country see an increase of patients with severe abdominal pains. According to gastroenterologist Dr Yasir Mukhtar, stomach ulcers and other gastro complications caused by overeating are common during Ramazan. 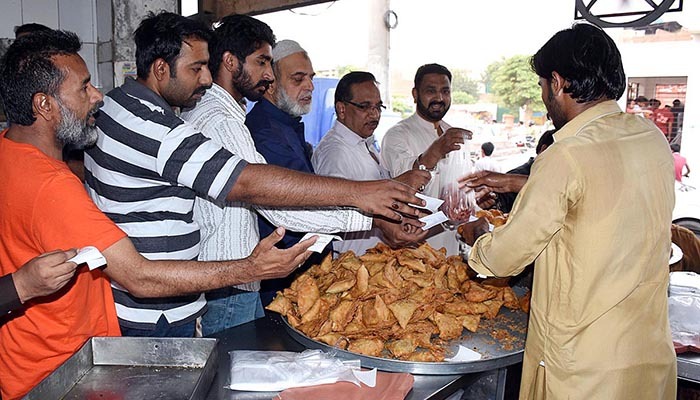 “Overeating at iftar and sehri can not only harm the body, but it may also interfere with a person’s spiritual growth during the month, causing fatigue, sleepiness and lethargy,” Dr Yasir stressed. The gastroenterologist said fasting during the holy month can improve health but the correct diet is not always followed, and usually, food habits change to overeating carbohydrates. Other trends are overeating in a short period of time, unregulated eating and many fasters losing control and developing an uncontrolled appetite once Ramazan has finished. “They [fasters]can eat anything but the most important thing is that you have to start with fluids and the food with fewer calories, non-fatty foods,” Dr Yasir advised. Health specialist Dr Sheryar Amjad said a widespread habit is sleeping straight away after sehri, which can result in acid reflux. Another common practice is overeating during iftar, followed by smoking. This bad habit paves the risk of triggering dyspepsia and acid reflux for gastritis/PUD patients. Therefore, patients should moderate when breaking their fast, eating smaller portions, but more frequently. For instance, start off with dates and light food. Then eat the main meal later on in the evening.